Discover new tea blends from our ever growing selection! Delivered straight to your door on a monthly basis. Get a FREE packet of Tsacs to infuse & enjoy your loose leaf tea from wherever you are with this 3 month subscription plan. Each subscription box contains a 4 packets of loose leaf tea, which brews over 40 cups of tea throughout the month! What you'll get: -Tea cards to collect: they tell the tale of the teas. -4 different combinations of expertly picked teas, from 10-20g each. (Enough for a tea per day). -brewing guides and recipe recommendations. -try, share, enjoy. - FREE packet of Tsacs to make your loose leaf tea wherever you are! The Tea-sacs are suitable for one cup or a family size 4 cup teapot. 'Make your own' teabags are unbleached so do not affect the flavour of your desired brew. One pack of 100 single use, fill your own, tea-sacs. Recyclable. Service rating : Friendly emails and good quality of teas. Some unexpected surprises and kind notes! Love it . Product : Excellente qualité de thé. les mélanges sont originaux et bien équilibrés. Service rating : No issues with customer service. Product : A Christmas present bought for my Mum. She's absolutely loved it. Works great with her resolution of becoming healthier, it's a plus that Suki Tea offer great tasting products at fair prices. Service rating : Very fast delivery and a good amount of emails informing of different stages. Great communication and opportunity to ask questions at any time. 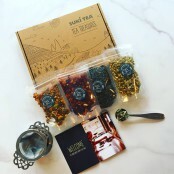 Product : Tea subscription; it is a reasonable price and a great way to try different teas each month. Presented beautifully with an... Service rating : Very fast delivery and a good amount of emails informing of different stages. Great communication and opportunity to ask questions at any time. Product : Tea subscription; it is a reasonable price and a great way to try different teas each month. Presented beautifully with an appropriate amount of tea (enough to last you the month). The cards are a great way of keeping track of what you've tried, I mark on them out of 10 so I know which teas I like the best and can purchase them in future. Very happy! Thank you for your feedback Megan, we really appreciate hearing from our Customers! It's great to hear you have enjoyed our Subscription boxes, they really are the best way to taste something new. Product : Big big fan of the subscription boxes as they give you a taste of different teas you may not have thought of trying and may find you a new favourite! Great value for money. Love the free delivery. Always plenty of variation in each box. Good website with plenty of choice. Special offers - just right for Christmas gifts. Ordering was very easy and follow on service excellent.